David Harvey theorizes that the spatial pattern of globalized capitalism can be understood in terms of spatial ‘fixes.’ Short-term reconfigurations of space become the vehicle through which problems (often related to capital accumulation) are resolved. However, this is often a contradictory process: a space that was once historically used for one phase of development is destroyed to make way for a new spatial fix to resolve a crisis. Lately I’ve been thinking about Calgary in the context of this kind of theory. I haven’t really fleshed it out yet, but here are some fun facts. They may or may not be related. 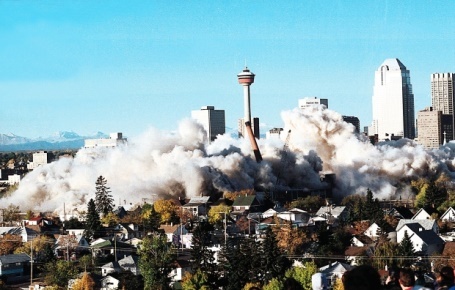 In a presentation at the Parkland Institute, Jordan Hamilton observed that much of the original housing stock that existed in downtown and the East Village has been demolished; over 56 structures that provided housing in the area have been destroyed or closed since 1970. You can view his presentation here at about the 30-minute mark. Even if we could get secondary suites approved throughout the city, there’s no guarantee it will solve our housing crisis. Will there be a flood of people building suites, saturating the market and bringing prices down? Unlikely, at least in the short term. It certainly can’t hurt, but the fact we can’t even get this Band-Aid solution through council demonstrates just how far this city still has to go in order to live up to its hype as a great place to live. Because the truth is, for vast swaths of the population, this isn’t a great place to live; it’s a place to scrape by while praying your landlord doesn’t up the rent. 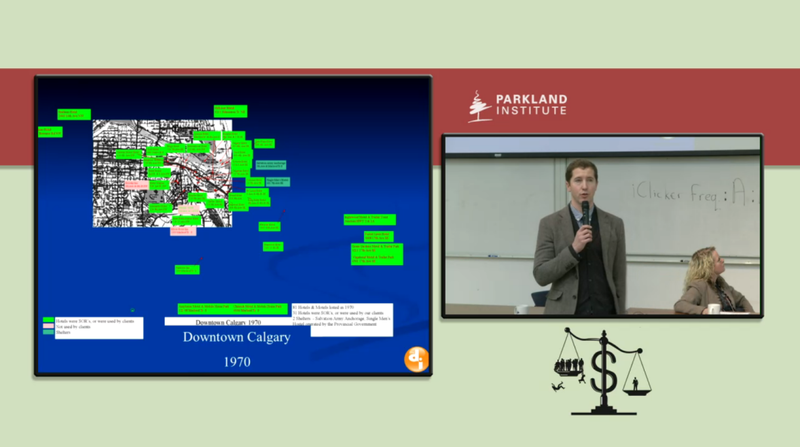 Also at the Parkland Institute, John Kolkman presented his findings on poverty and inequality in Alberta. What was super disturbing about his presentation was this graph. 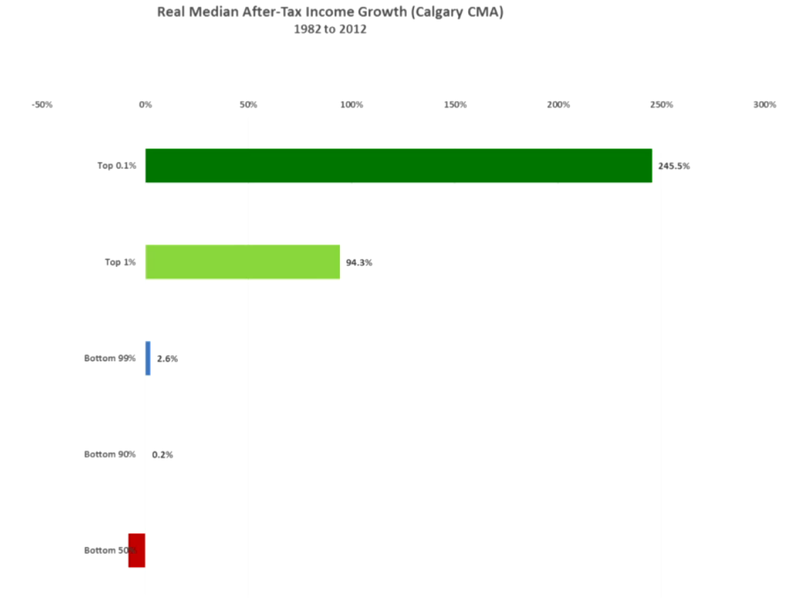 And yeah, the bottom 50% actually have seen negative growth (down by 8%) in after-tax income growth over the last 30 years, as opposed to the 235.5% increase in income seen by Calgary’s 0.01%. Lastly, a few hundred meters from the site of the former General Hospital (featured at the top of this post in a cloud of smoke), is the East Village! There are plans to build upscale condos, a shiny library, and a shiny National Music Centre there. 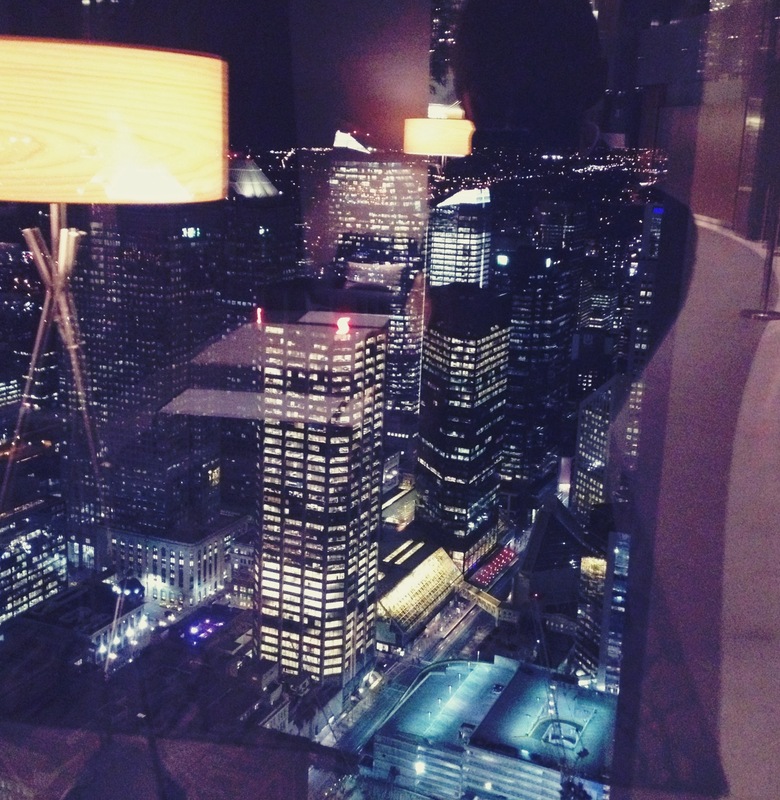 Last Wednesday, October 15th, the Calgary Chamber of Commerce brought the brightest political, scholarly and business minds together and hosted an outstanding world-class event in the panoramic setting afforded by the 54th floor of Calgary’s newest and tallest building – The Bow. With an audience populated by notable Calgary business persons from EnCana Corporation, Brookfield Residential Properties and Nexen to name a few; dignitaries; local business owners, and some nervous students, the floor was set for an evening of noteworthy speakers sharing their ideas and engaging in the promising conversations. Mayor Naheed Nenshi began the evening by introducing the concept of humanity and togetherness in communities post crises. He referenced his experiences with the recent problems that have affected Calgary in the last year: the 2013 flood, recent fallen trees and power outages; these he says, represent demonstrate the remarkable humanitarian effort by Calgary citizens and local government during the cleanup after the disasters. He spotlighted the tight bonds created in our city and how those unaffected by the calamitous events came to assist those who lost homes and belongings and had to stop businesses operations due to the power of nature. Moreover, Mayor Nenshi highlighted the key role of a mayor that is to be in touch with everyone in order to truly represent the interests of the city. ‘God bless the garbage men’ he emphatically stated, emphasising the fact that regardless of place in society, a city cannot function without all its necessary parts, and that his role as Mayor of Calgary is to represent the voice of every member of our city. 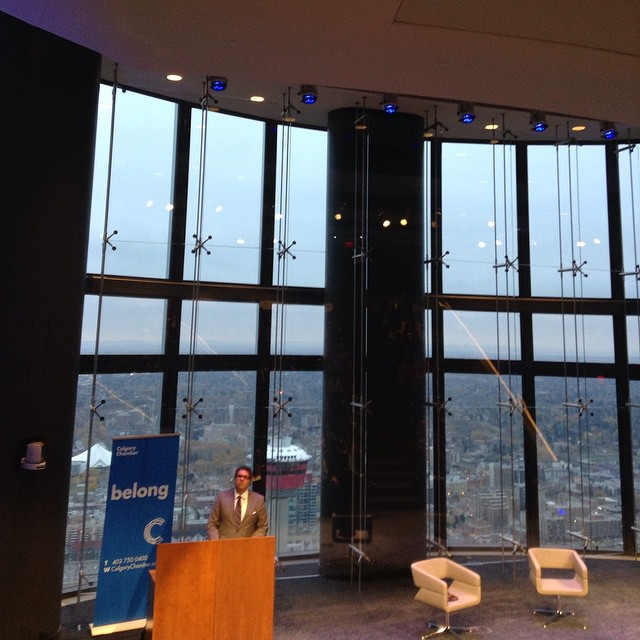 Following on from Mayor Nenshi, the key note speaker Dr. Benjamin Barber took the floor. Dr Barber, a political theorist at the Graduate Center on Philanthropy and Civil Society of City University of New York, as well as president and founder of the Interdependence Movement, and author of seventeen books, set forth his philosophy of poly-cultural cities and their municipal pragmatic governments. His concepts centre around pragmatic municipal governments which are empowered by the central government to look over its citizens, not countries built on impaired institutions, rigid ideologies and sovereignty practices. Citing research from America that suggests an increase in confidence in the roles of local governments that falls in line with figures for US Congress, Dr. Barber highlighted that the mayor of the city has a greater opportunity to maintain a role of both figurehead and part of the community, thus increasing the togetherness of the city. Dr. Barber followed on with a discussion of his philosophies by stating that democracy, interdependence and sustainability are the key elements to achieve success in problem solving on an international arena, providing the highlights of the first “The Parliament of Majors” meeting in London, 2015. This meeting will represent the perfect future opportunity for an intercity collaborative discussion helping to combat universal problems of pandemics, terrorism, disease, and environmental issues. According to Dr. B. Barber, it is global democracy that combats these fundamental issues and challenges. ‘Tearing down” 17th century Nation State walls will allow room for discussion between city mayors. The creation of leaders who are conscious of their city’s life, would lead to cross-country collaboration, creativity and prosperity of multiculturalism. After the formal talks had finished and the backdrop of the glorious Calgary night vista of The Bow kept the participants breathless, all speakers were amenable to further enquiry by the thoroughly engaged and compelled audience members. The event achieved its purpose to not only discuss the role of mayors and the importance of their engagement in the city life, but also went beyond picturing Calgary’s future as a leading city one day aligning with Paris, Brussels, Washington and New York. Next time, we hope to see you there! Helga Packeviciute is an Urban Studies major in University of Calgary. Her interests in architecture, sustainable urban planning and public engagement have drawn her to join UrbanCSA this Fall, 2014. When seeking for the break from her studies, she can be found running trails or skiing slopes in the Rockies. This is a surprising statement about an industry that has been carefully orchestrated and guided by government policy. First, the nature of land as a commodity is an issue. Karl Polanyi describes the establishment of land as commodity an “entirely fictitious” though necessary and useful exercise: one cannot really produce land, store it in warehouses, or convert entire landscapes into raw elements (though some try). So while it’s not a real commodity, in the same way that linen coats or widgets are, it gets treated as one as a basic part of a market system – one can’t have a factory without a place to put it. To turn land into commodity, it has to be given a status through laws, in institutions, and so on: this is called government intervention. Beyond this theoretical feature of land-as-commodity, consider also the fact that housing has been massively shaped by the Canada Mortgage and Housing Corporation (CMHC), a Crown corporation. Historically the CMHC has financed suburbanization across the country through low-cost mortgages, and today, ensures residential mortgage loans as part of its mandate. As Richard Harris argues, a particular kind of housing (suburbs) and a particular way of financing it (CMHC) made it the only readily available housing option for most post-war Canadians. All this is to say: it’s a bit rich that Prentice is deploying “the market” as the solution, when “the market” is itself orchestrated by government policy. This is a way of avoiding the issue, while explicitly offering support for the beneficiaries of the current system. Who benefits from the current system? High housing prices are great for people who happen to own lots of housing, build housing, and invest in housing. If you happen to rent property, high demand works in your favour. If you sell homes, sell mortgages, or sink a chunk of your paycheque into a mortgage payment on a regular basis, a higher price, higher property value, and high demand probably work in your favour. An unfortunate result of suburbanization and the accompanying home-ownership craze, as David Harvey has noted, has been a new kind of politics: focusing community action towards the defence of property values and individualized identities. By contrast, a functioning democracy might allow for the following questions to be worked out politically: what kind of city do we want to live in? Who is included? Who is excluded? How should we allocate our collective resources? Narrowing the discourse about housing (and cities generally) to simple “market realities” excludes social actors that aren’t major market players – like the working poor, the young, the homeless, the unlucky – and is a way of avoiding what should be a political and democratic conversation, and turning it into a decidedly more private and profitable one. A precondition to the eruption of a zombie horde is an empty street. A newspaper, or tumbleweed, caught in the wind floats across the abandoned scene. The soundtrack ramps up, and the flesh-eating undead turn the corner. A perfect setting for the classic zombie story. Most people would consider zombies the creepy part of this scene. But really, the scene is creepy before they appear: the street is empty, and the uncomfortable strangeness and isolation that results from the empty street makes discovery of the zombie horde all the more chilling. The people that were supposed to be populating the street are gone. The monstrous aspect of the undead is paired with an absence of people from the urban milieu. People have been removed from urban life, and it creates an exposed, isolating setting, where all manner of terrible things can occur. The absence of life from the street creates the conditions for a total breakdown of social order, and urban space is transformed: no longer homes, shops, streets and parks, the city is now a survivalist battleground where horror reigns. This is the opposite effect of Jane Jacobs’ “eyes on the street”—the absence of street-level human activity transforms the space into an occasion for terror. One key insight that I find particularly useful from psychogeographical texts is the importance ascribed to the subjective human experience in urban settings, and in particular, the emotional and imaginative states experienced as one journeys through urban space. The strength of this type of analysis is that in addition to the various technical and architectural specifications common to urban design (street/sidewalk distance, pedestrian access, zoning), psychogeography takes into account the importance of the imagination. Streets and cities are not made up simply of bricks, concrete, cement, trees, and signage, but provide the context for continuous imagining of scenarios as humans walk about them. House by human brains, cities are where dreams and fears walk around. The reason one particular area might feel exciting, or another dangerous and fright-inducing, has to do precisely with how the technical / architectural / design features of an urban landscape interact with this human imaginative capacity. One fears murder, monsters and being mugged when entering a dark, menacing alleyway; one feels caught up in a world of dreams when engaged in a street carnival; one feels a part of a bustling community and economy when strolling through a busy market. This is more obvious when the rhetoric and mythology surrounding individual cities is explored. The sloganeering around cities is engaged precisely in the manipulation of imagination and linking this imaginative process to particular spatial zones. Nothing about the brick-and-mortar identifies Calgary as “heart of the New West”, or city of mavericks, or whatever it’s called now. This sloganeering is intended to spur a certain set of imaginings when walking about the city: oneself as a pioneer, as intrepid, as exploring or breaking new ground, as part of a “new” economy and community. When engaging in arguments for density, pedestrian-friendly design and cycle lanes, it can be easy to get away from how urban spaces make you feel. So here’s an important question: how do you feel when walking around Calgary? Perhaps more directly: how many of Calgary’s streets are primed for a zombie outbreak? In what areas are there sufficient “eyes on the street” to make you feel safe? What streets, as you walk through the city, make a pedestrian feel abandoned, uncomfortable or downright spooked? Joël Laforest is an Urban Studies major and contributor to the UrbanCSA blog. He is well-versed in psychogeography and an avid fan of science fiction. UrbanCSA will be organizing a campaign on the Secondary Suites issue with various events on campus for student engagement for next 8 weeks! We require voluntary staff for our Secondary Suites Student Engagement Campaign from November 3rd to November 15th. Flexible hours available. We need help campaigning through social media and university groups, running engagement on campus, to ultimately present to City Council in December. This is a great way to gain experience with municipal policy and gain experience with public engagement. Want to share your opinions about urban issues? Whether you want to contribute on a one-time basis or with consistent submissions, we are looking for writers interested in urban-related issues. This includes but is no way limited to housing, local food culture, urban economies, art and architecture, and municipal politics. Free editing and writing advice if you are a novice. To get an idea of what our blog is about, visit http://urbancsa.org.